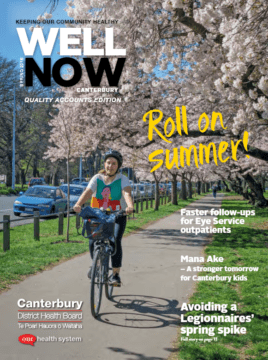 WellNow Canterbury is our community health magazine which goes to every Canterbury mailbox twice a year. This spring edition doubles as the Canterbury Health System’s Quality Accounts, to provide a picture of how well our Health System is meeting Canterbury’s health needs, and showcase our work to improve services and standards of care. The online-only version features a How we measure up section, charting our performance against the National Health Targets, and quality and safety markers as set by the Health Quality & Safety Commission, as well as other key measures. For a ‘taster’ of some of the stories inside, click on the individual links below. South Island’s only Hyperbaric Unit – not just for divers! Upgrades to Christchurch Hospital’s hyperbaric chamber have brought the facility in line with Australasian quality standards – and made the experience much more pleasant for patients. A pilot to reduce waiting times and waive unnecessary appointments has improved the experience of patients receiving prostate cancer treatment by freeing up their time. If you’re planning on doing some spring gardening, learn about the five easy actions you can take to prevent Legionnaires’ disease when dealing with potting mix and compost. Fush eatery is the latest venue to sign up to the Fresh Air project – a collaboration between Canterbury DHB and the Cancer Society, along with more than 50 other venues in Canterbury that choose to make their outdoor eating areas smokefree. Approximately 50,000 New Zealanders have hepatitis C. Knowing what puts you at risk of hepatitis C and getting tested is the key to preventing long-term liver damage caused by what’s now a curable illness. We illustrate how our Physiotherapy Service is using exercise machines designed to prevent muscle loss among those recovering from a stroke, and the creative way some of its staff are making exercise more engaging for patients. Read how Kia Kaha Chemist is working to improve health equity and outcomes for tangata whenua by strengthening the relationship between kaumātua (Māori elders), their pharmacist, and their General Practice team. We take a closer look at how Christchurch Central Service is making a difference to people seeking help for addiction, and how the Service is responding to the change in the primary substances people are wanting to be free from. Through hard work and collaboration, the Canterbury Eye Service reduced an overdue Ophthalmology follow-up waiting list of 3,347 patients down to 719 in one year. A state-of-the-art radiation therapy technique delivering a high radiation dose to a very small area has reduced the number and length of appointments required when receiving lung cancer treatment, as well as the demand for specialised equipment. We celebrate the mammoth effort that has gone into getting Christchurch Outpatients ready and open for business, and cover the three principles underpinning the Canterbury DHB outpatient care model. Scheduled to open in 2019, more than 600 contractors are beginning the finishing works. Check out the 2017/18 results of New Zealand’s largest health survey.